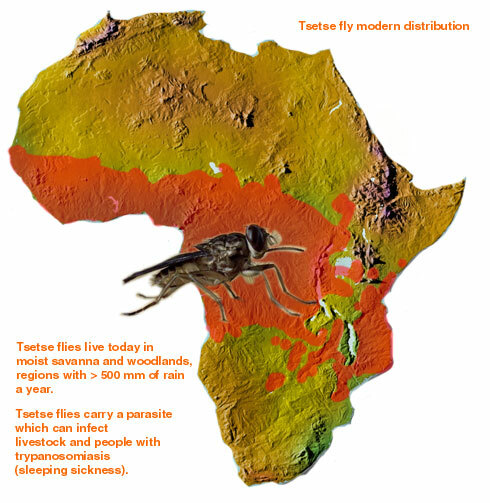 Infection starts with a bite from an infected tsetse fly that develops into a sore. As the trypanosomes multiply in the bloodstream, symptoms such as headaches, joint pain, fever, and itching can occur. When the parasites cross the blood-brain barrier into the central nervous system mental impairment, lethargy, and coma can result. If the disease is left untreated, an infected person will die. A few drugs are available to treat the early stages of infection (while the parasite are only in the bloodstream) and for the late stage (after the parasites cross the blood-brain barrier). The early stage drugs are more effective and less toxic while late stage drugs are more toxic and less effective, although all are difficult to administer and resistance is developing. Since African trypanosomiasis is invariably fatal if not treated and current drugs are toxic, difficult to administer, and resistance is developing, it is essential to do basic research in order to better understand parasite biology and to identify unique and essential targets that may serve as starting platforms for new drug therapies. In our laboratory, we study many processes in T. brucei that are important to its survival. 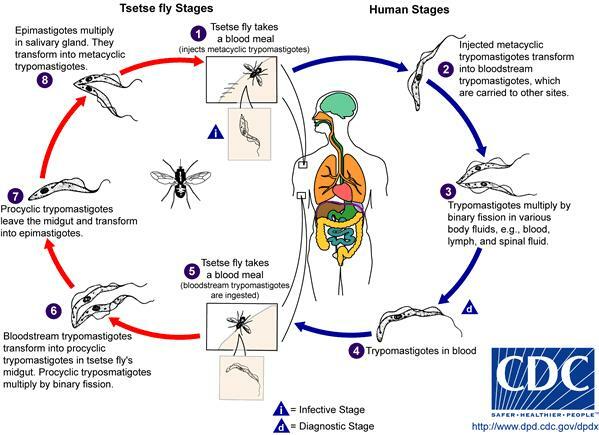 Trypanosomes have four life cycle stages due to their transition from tsetse flies to humans and back again, two of which can be cultured in the lab. During these different life cycle stages, extensive remodeling of both nuclear and mitochondrial gene expression occurs, and the mitochondria undergo dramatic morphological changes. The figure on the left, from the CDC displays these life cycle stages.